Ben Kepes is a conductor, composer and pianist based in Montreal. After completing university studies in composition, Ben co-founded in May 2014 a new professional orchestra, the Montreal Lyric Orchestra. In May 2015 Ben was invited to guest conduct the Orquesta Sinfonica de Venezuela in a program of Tomasi, Arutunian and Beethoven. In addition, to celebrate the memory of his father, Ben conducted a fundraising concert in May 2016 which raised over $12 000 for St Mary’s Hospital. Ben is currently pursuing his Master’s degree in orchestral conducting at McGill University under the supervision of Alexis Hauser. In the summer of 2014 Ben was the apprentice conductor of Boris Brott for the National Academy Orchestra of Canada. 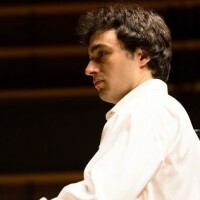 Ben’s conducting experiences stem from his work with amateur operatic societies, contemporary music, masterclasses abroad, and his willingness to create his own ensembles for independent concerts. Ben’s principal teachers in conducting include Alexis Hauser, C. A. Bünte and Konrad von Abel.